There has been much debate on whether editors should or should not be cutting in the field. There really has not been a portable, inexpensive solution for I/O, except for the AJA IO HD. Now I really loved this device! However, it is quite costly and is limited to Apple Pro Res. There is no real competition for it until now. Matrox MX02 Here it is the Matrox MXO2, boasting a slew of features and ready to take on the heaviest of workloads you can provide. This week I will begin a 2 part series on the MXO2 and how it works. The initial impressions are good. Weighing in at just under 3.5 lbs- it truly is portable. (Even in the factory sealed box, I could hardly tell I was holding it.) Upon opening the box I was pleased to see that both adapters were there. It connects to the Macbook Pro via Apples Express card slot or to your PCIe Express card slot in your Mac Pro tower. This is great for keeping the MXO2 portable, without having to buy an accessory. Unfortunately, to my amazement, there is an accessory that is needed. I was astonished to find out that it was the power cable. Why this is not included I am not exactly sure? It only saves Matrox around $3 dollars. It causes us unnecessary stress to either search our bins of spare parts for the cable, or have to make a trek back out to buy one. The connections on MXO2 are here in abundance. There are HD and SD inputs and Outputs. Another surprise was the lack of Firewire connections. 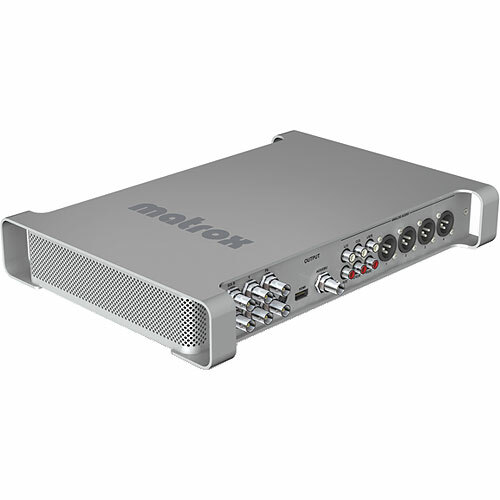 Matrox has stated that there is no need for a Firewire 800 bus as it limits capture. Instead they insist and provide you with an express card for use with your express card slot. Therefore they are not limited to the Firewire 800 bus. Hook up and installation was a lot easier than I expected. I really thought this would have been problematic. I was wrong. The adapters for my Macbook Pro and my Mac Pro were a breeze to install. It was just plug and play. However, Matrox for some reason or another did not include an install disc. Instead they included a small yellow sheet of a paper, that stated I had to visit their website and download the drivers. Keep that in mind for anyone doing this install in the field. Hopefully you will be near a Wifi station. The program did the install without a problem on both of my machines. They are both on Leopard 10.5.5. Matrox does warn that you need at least an Intel based machine. After installation you will find in the System Preferences, that you now have an Icon for the MXO2. Under the various tabs you can select different inputs/ outputs, for both monitoring, and Genlock. There is also a drop down menu for 2 different types of Pulldown methods 2:3:2:3 or 2:3:3:2. You can also select the type of downscaling to Letterbox, Center Cut, or Anamorphic. You have the ability to calibrate an HDMI monitor to broadcast levels. Keep in mind you really should have a monitor that is capable of 1:1 ratio. This will ensure that what you are seeing is a reference quality for broadcast and in the correct aspect ratio. Now we are ready to dive in and begin testing the limits of this device. I was pleasantly surprised at how easy it was to set up. Shortly after purchasing it, Matrox released an update v. 1.1. I immediately downloaded and installed it. Just remember to follow their directions to the letter, otherwise it may cause problems with your FCP. Now I know there has already been an update for FCP as well. However I am weary of updating it. For my purposes I am still running running 6.0.4. As they say “If it ain’t broke don’t fix it!” I have already seen problems caused by the new FCP update. I will test that out on a later date. Working with the MXO2 has been a joy. First I wanted to cover the basics. I began with monitoring on an HDMI screen. Then I used both my MacPro and my Macbook Pro with the Matrox. I was previewing on a Sharp 52′ Aquos. The image quality was truly outstanding. Matrox recommends using a monitor that is capable of a 1:1 ratio, or a “dot-by-dot”. This ensures that there is no scaling done by your monitor and you view your exact image. There was also a calibration mode for my monitor. This is great for color correction and viewing a broadcast quality signal. Capturing through the MXO2 was relatively easy. Just hook up your deck and begin a normal capture process. Now I know you don’t have to use any specifc codec with the MXO2, however using the “Easy Set Ups” provided by Matrox keeps it simple, and you are less likley to run into any issues. Now I did test out several formats using various inputs. However I did find that the HD/SDI input works best for me as my decks support it and I wanted the best possible quality. I injested footage that was on DVCam, HDV, P2/720p, and I also got my hands on some XDCam 1080p footage. All of them went into FCP without any hiccups. Now comes the fun! Lets throw them all into one timeline and see what happens. Matrox claims that you can play multiple formats in the same timeline without any issues. I concur. There was no render needed to preview and edit. The MXO2 is fully capable of up scaling and downscaling in realtime. The downscaling created great images for SD, from 720p without any real issues. However, not being a fan of up scaling to HD, I found the results to be less than favorable. Scaling from DV to 720p or worse to 1080p, created plenty of activating and pixelation. Matrox had improved the downscaling feature with the new firmware update, and one can only assume that another will resolve the up scaling issues. I was impressed that I was able to playback several layers of HD footage without any drop frames or lagging issues. The MXO2 has proved itself there. Just take a look at the picture I took of an HDV (1440×1080) shot up scaled to full 1080p (1920×1080). I also tried to use different frame rates in one timeline and speeds. This again proved to be no problem for the MXO2. However, when I was converting from 29.97 to 24p I did find that FCP would give me a dropped frame warning. This is normal, and yet another reason to let your deck convert the footage frame rates. This could easily be bypassed by turning on “Unlimited RT” in your time line. The only real limitation I found so far was a timeline I created using only 720p footage. I created 1 layer of 720p then I threw on another layer of 720p with speed raised up by 150% on top. Then I threw on a text layer. Finally underneath all that I threw on one more 720p footage but added a Bloom effect. After all of that, then the Matrox said it was time to render, and it could not play back a preview either. That is a lot for any device to handle. Thus far, I am amazed at what the Matrox MXO2 is capable of-It is truly a portable I/O. It is quiet, easy to install, and most of all it is far cheaper than their competitors. If you have a need for an I/O that is mobile and affordable, then look no further, Matrox has delivered. Matrox has also told me that with upcoming new firmware updates you can expect a whole lot more coming from this little box. I can’t wait to see more out of this little gem.